Aim: Many artists use installative drawings and what these artists are doing positions the viewer or audience member in a totally different way to someone viewing a work on the wall contained within a frame. Method: Make a drawing that relates to its environment in a way that creates an interesting dynamic between the artwork and the space around it. Think about ways that drawings could take part in a kind of dialogue with the space they inhabit. Text might be one way, or a drawn object in partnership with its real world equivalent. A drawing of flowers might be positioned behind a vase. A drawing might be used to ‘join up’ the view between two windows. You might be interested to find out more about trompe l’oeil or even anamorphosis – seen in Holbein’s painting The Ambassadors but also seen on football pitches and in the street art of artists like Kurt Wenner and Edgar Mueller. Reflection: Use the links below to find out more about Pierrette Bloch. Why is she described as using ‘poor materials’ and what do you think her materials lend to her subject matter? 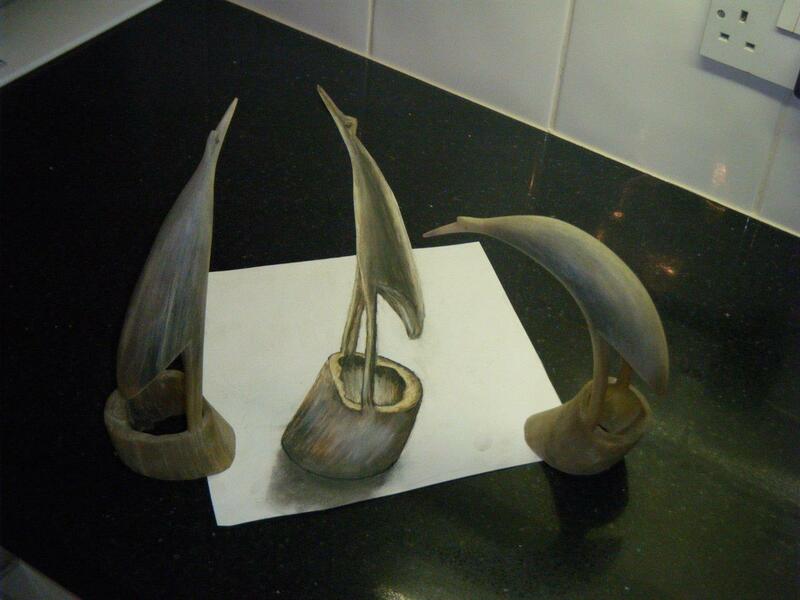 After the research into trompe l’oeil and anamorphosis I felt drawn to creating some images with these elements. 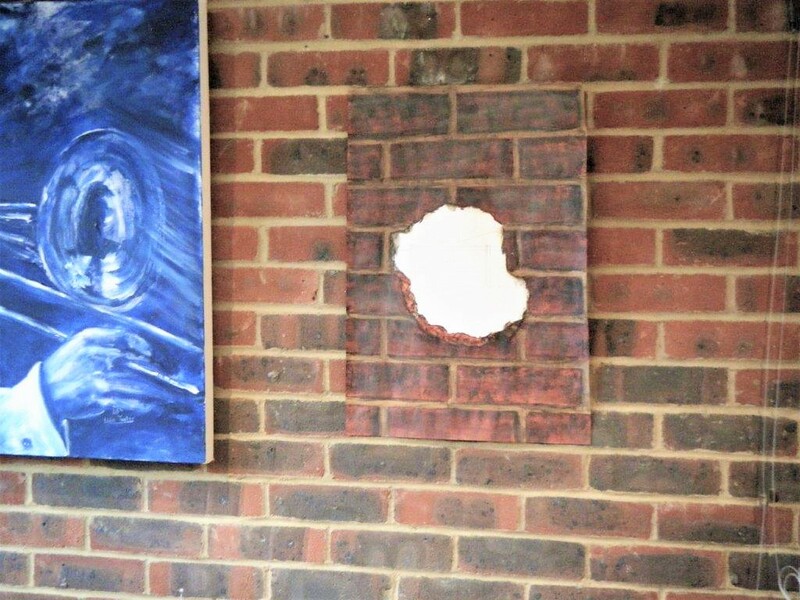 The first of these was a ‘pretend wall niche’ in a brick wall. 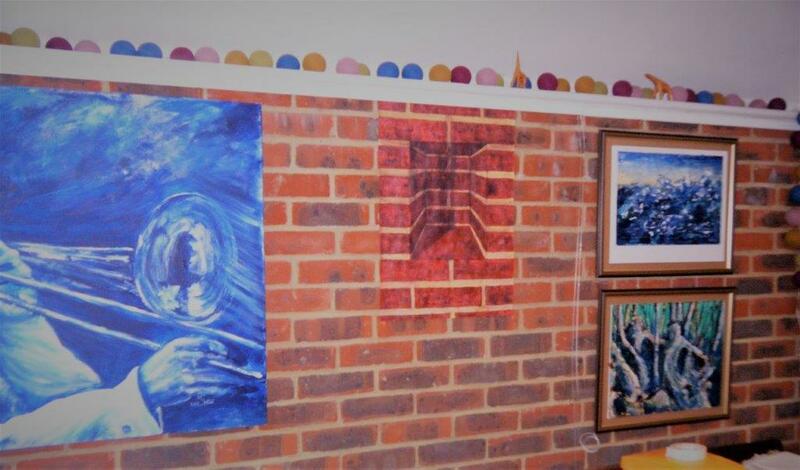 To bet the correct size of the brick courses etc I did a wall rubbing which was then used as the template for the front face of bricks. The perspective of the niche itself was determined using guesswork. 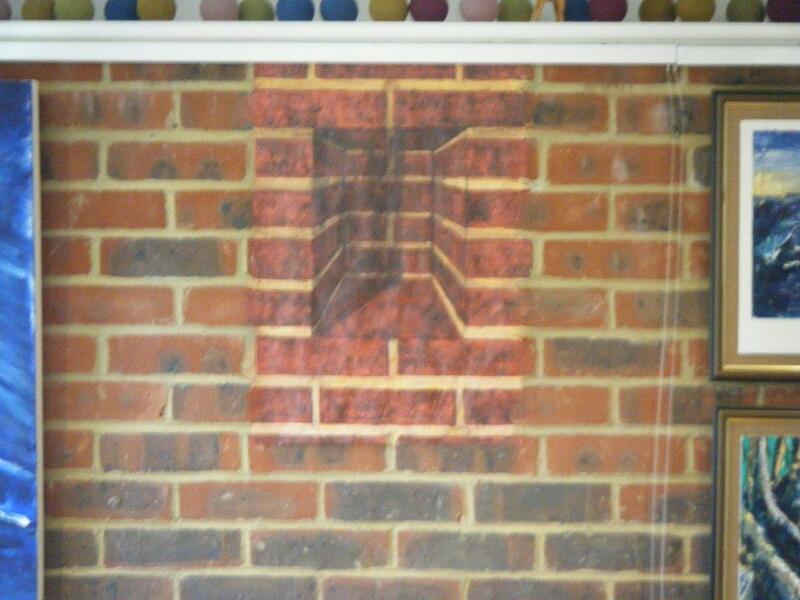 In this work the main drawback was the accuracy in the colour of the bricks. I was able to achieve the correct texture utilising sponges etc. In much of trompe l’oeil art a complete wall would be drawn and painted, this would eliminate the need to achieve a match in the brick colour. 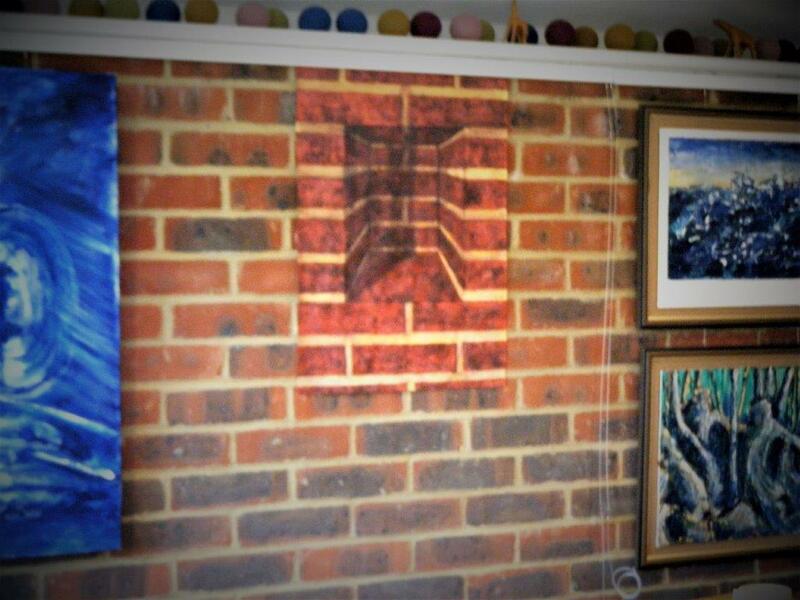 An trompe l’oeil niche in the wall of my home extension. Unlike anamorphic images the optical illusion of trompe l’oeil should be visible from all viewing positions. Continuing the trompe l’oeil theme I next decided to do a work outside. Near my home there is a pavement alongside a group of trees and bordered by garden walls. In this area I wished to create the illusion that a missile had knocked a chunk out of a tree trunk and carried on through a near-by wall. 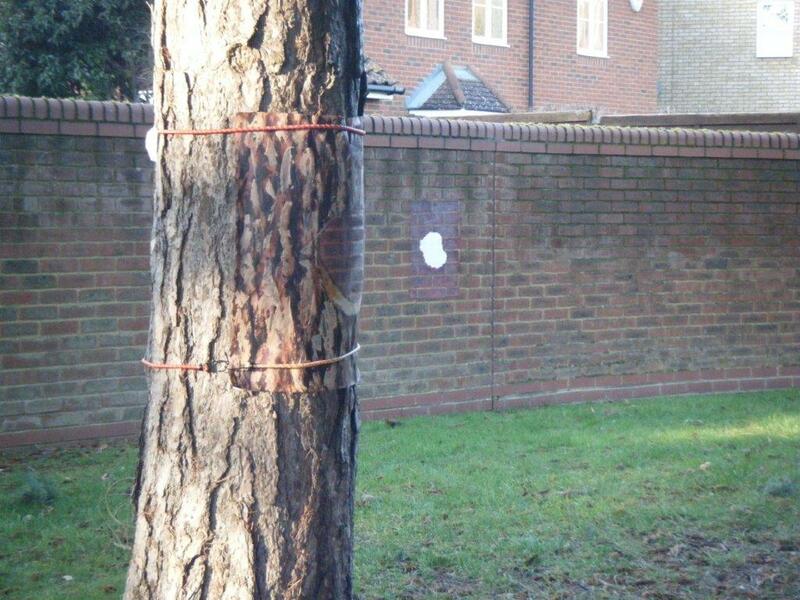 For this illusion I needed to produce two images – one of the damaged tree and another of the pierced garden wall. The image on the wall was secured using double side tape. 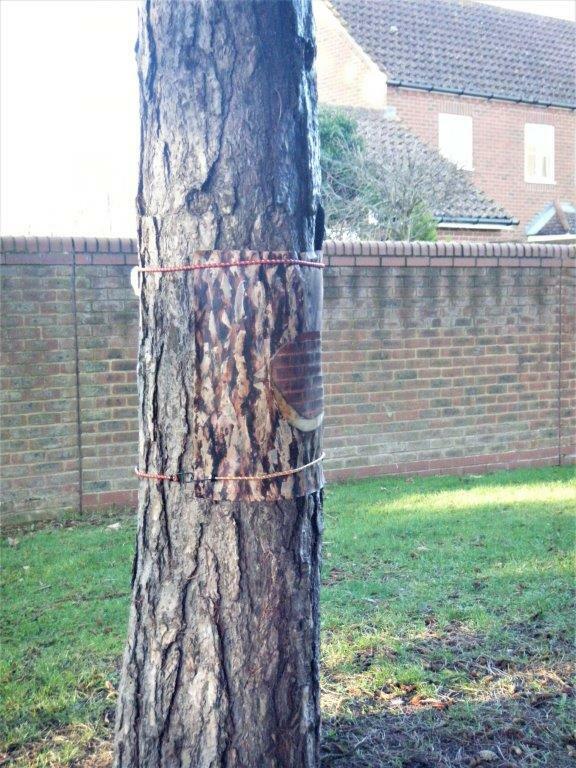 The tree was resistant to this tape so I used a pair of bungee cords to secure the tree image in place. Tree trunk with trompe l’oeil damaged element. 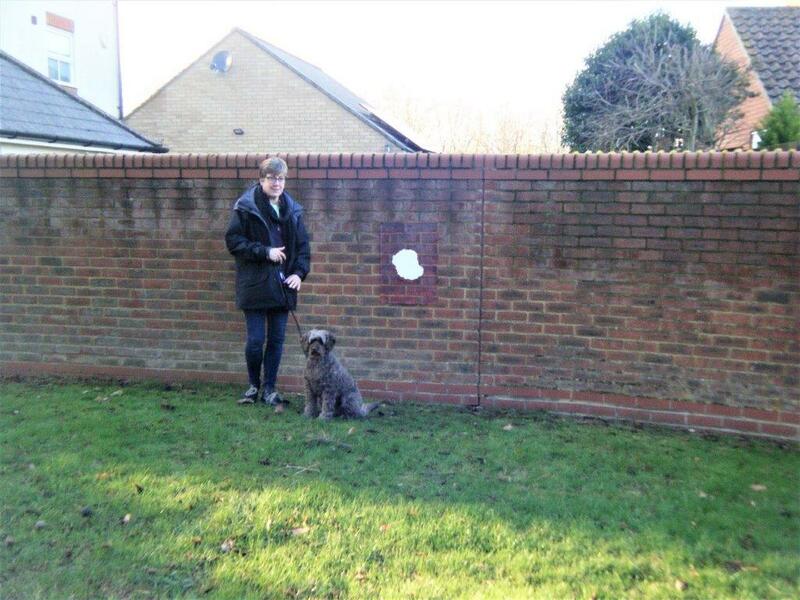 Gill and Cocoa pose beside the ‘hole in the wall. Like the indoor niche achieving colour accuracy was difficult and not quite being achieved. The outdoor brick has a salt bloom that casts a grey spray across the wall though not quite evenly. 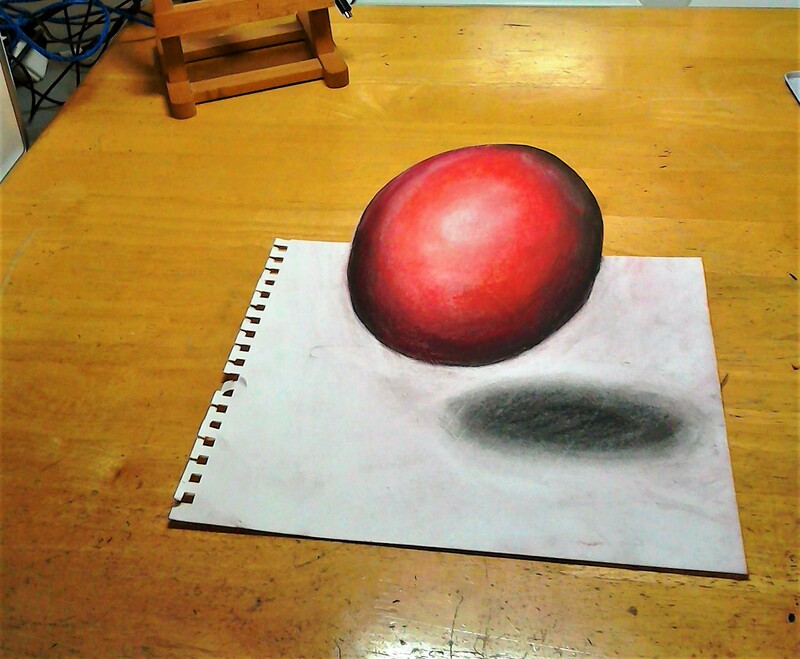 Further to my research on anamorphic art and for this exercise in both the previous centuries and contemporary times I have done a couple of anamorphic images. When viewed form the correct distance /angle the flat drawing becomes a convincing 3-D image. 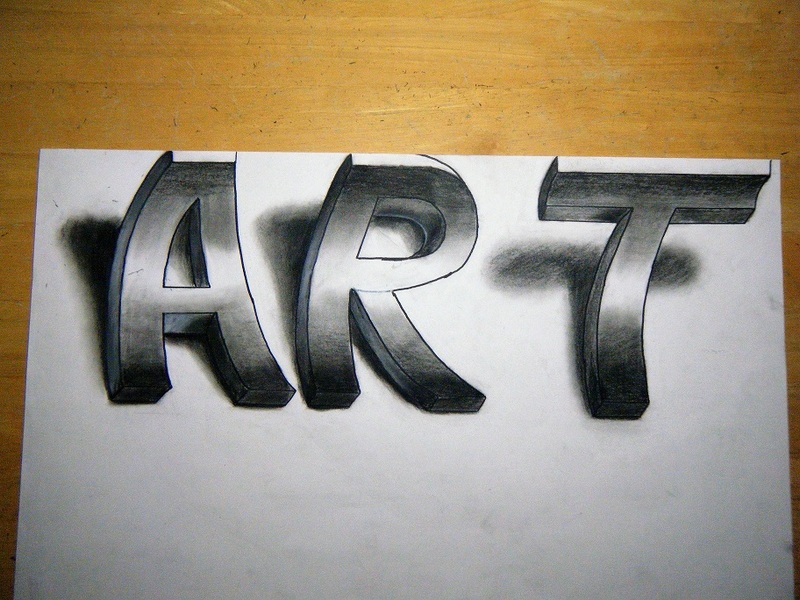 Flat lettering shaped and lengthened to become an anamorphic design. When complete the upper section of the lettering was cut-out to heighten the 3-D effect. The placement of shadows is important to ensure the image is compatible with surroundings. These drawings were quite enjoyable and fun to do. My family were quite astounded by the effect of these drawings and photo images. The design for such images can be determined mathematically but unless elements are critically shaped then a looser approach can be used. A rough and ready method is to place an item the approximate height you wish the image to appear and then retreat to the viewing position and note the size on the paper it appears. This will then be the anamorphic length. Artists in the renaissance especially those that worked in perspective determined various mathematical means to do this with great accuracy. The anamorphic and actual carvings placed together and viewed from the optimal distance and angle, this works better on the darker surface see image below. 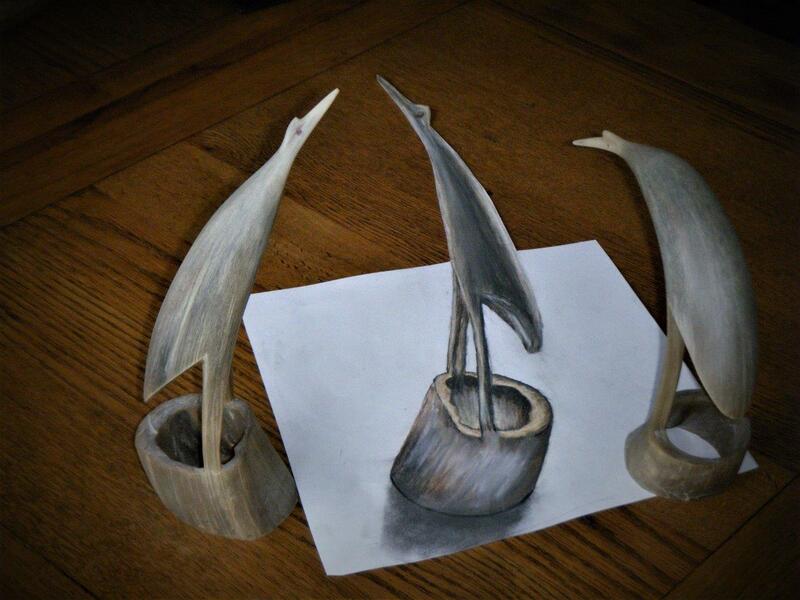 Real and anamorphic copy of egret carvings. 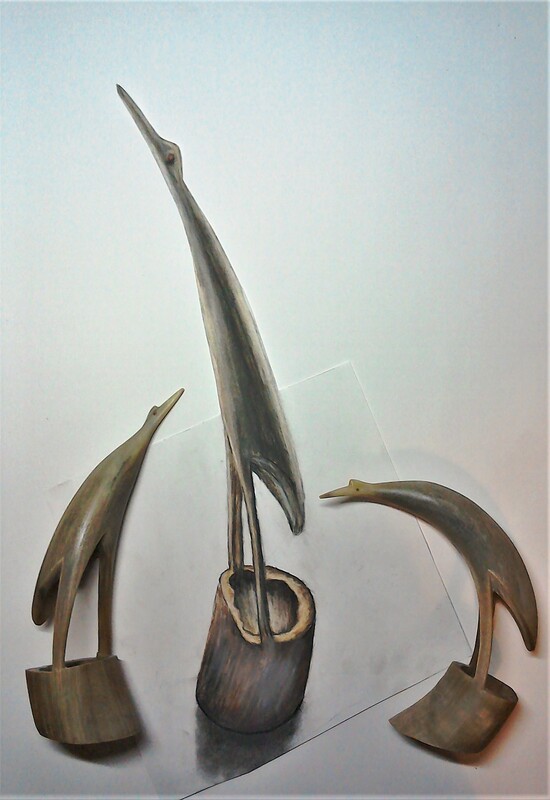 Set of Three egret carvings – 2 real and 1 ‘pretend’! This drawing was done by using an extended pencil to mark the ‘correct’ points on the paper when viewing the actual carved egrets at the same time. This way I could ensure that they were compatible in size and shape. The colour was a more difficult issue. I had two drawings of egrets but used coloured pencil and other waxed based media resulting in an unconvincing sheen from the paper unlike the actual real highlights. What interesting work! I like the trompe d’oeil work, especially on the tree. But it’s all impressive.